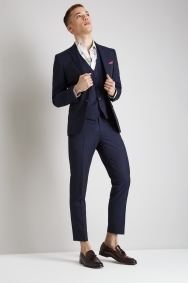 If looking sharp is on your agenda, this is the suit for you. It ticks all the boxes in the smart and stylish checklist. It’s cut in a skinny fit to define your frame, has an easy-to-wear rich ink tone, and the 3-piece design will suit any occasion. 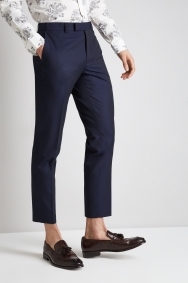 You can even choose between cropped and full-length trousers to suit your style. Wear it for work or play, and rest assured that you’ll look the part. You’ll have lots of styling options with this single-breasted suit. 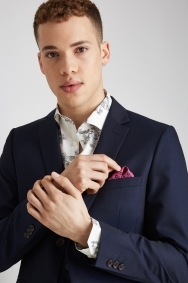 Go for a party look with a patterned shirt worn open necked, or with a blue shirt and a yellow tie for work events. 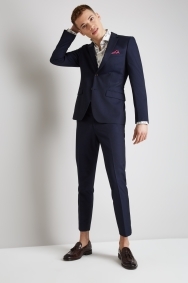 Ordered 2 x suits for a special occasion. Kept one and returned the other. The one we kept was great value for money but looked classy. Lovely fitting jacket. Brought in the sale at a great price. Fits great. 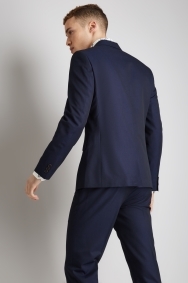 The suit I bought for my son looks great, a good fit (which is difficult as he's very tall and skinny) and a good colour. 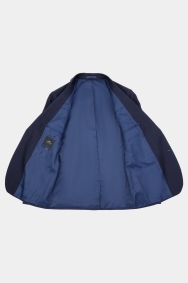 The jacket is well tailored, so no bagging at the front, but comfortable when he moves around. Excellent colour, fit and price. 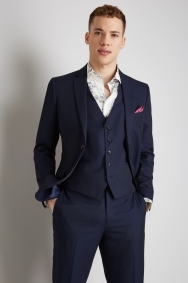 Nice fitting suit and quality very good. 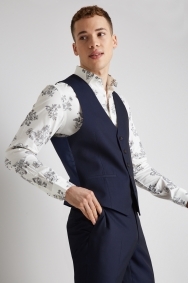 Very well made, quality suit and lovely shirts which iron very easily. Fab quality and a great fit. Very happy husband. I like the darker hues in the garment. Jacket is good quality and fits lovely. Highly recommended. This style of suit is pure class. Exactly what I needed, and for a very suitable price! Competitively priced, but quality does not match price. Great suit. Fits really well and the texture and thickness of the jacket is utterly great. Greatly recommend. Part of the 3 piece suit. Nice design for a young man chosing his prom suit. Good suit. Stiching come loose but it's OK.